1. Medical/Health for adults and children. We take sick people to Hospital and pay their costs for food, transport and sometimes their Medicine and Hospitalization, Birth control, Vaccinations, Safe water deliveries, Formula milk, Mosquito nets and more. 2. Education/Vocational Training for children. We transport children to and from Government school, at our center we provide English lessons, Phonic lessons, Computer classes and Kindergarten classes. We supply books and uniforms and other education material, all are supplied free of charge. In Phnom Penh we provide University Scholarships and Apprenticeships if we can afford, we provide for all their accommodation food allowances etc. 3. Family Assistance for all in our Villages. The elderly, some deserted mothers and those that are suffering illness often need special support, it may be providing rice, paying for medical expenses, medicine or transporting them to and from the facility that help. Sometimes we can find work for individuals or families, we often deliver free footwear, clothing and other items. CHOICE Cambodia is a Non-Profit organization (NPO), founded by expatriates in 2006. Registered in England and Wales No. 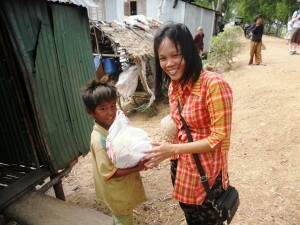 1140909, and in Cambodia as an NGO and has registered support branch’s in Germany and Australia. The team all volunteers and most living in Phnom Penh strive to make a difference to the extremely poor and disadvantaged people of Cambodia. We classify the extreme poor as those Khmers who are homeless, or have no land, jobs and no adequate health-care, they do not have the resources to provide for themselves. 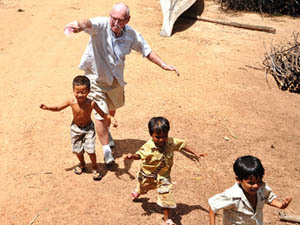 The organization is also committed to addressing the plight of children. Those who are orphaned, abused, and those homeless children whose parents can no longer care for them. We are driven by a very strong commitment to keep families together. We provide extra support to the parents of children, rather than allow poverty to separate the children from the family. The Trustees of CHOICE are totally committed to a 100% transparency and run by a 100% Volunteer policy. All financial records are always available to donors for inspection. 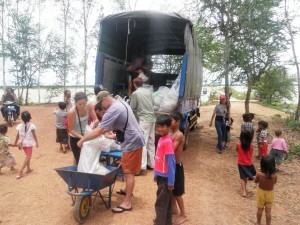 We need your financial help and support and if you are visiting Cambodia and in Phnom Penh, please join us on one of our trips and help with our daily water deliveries. We need volunteer teachers, kindergarten assistance or IT teachers at our Center preferably for the long term.